Like most busy people, I find it hard to keep a regular physical training regime whilst working. As a busy Stunt Coordinator I often travel the country and work long days with very early starts. Non filming days are filled with reading scripts, budgeting stunt sequences, writing risk assessments, traveling to recces and production meetings. Staying fit, strong and supple enough to perform stunts is critical to helping physical coordination and avoiding injury. Many stunt people find these fitness levels decrease as they get more regular work and become generally busier. Fortunately experience and having a strong sports background often makes up the shortfall but it's not the ideal solution. I've met many people in other walks of life who face the same challenge. We'd all like to be as fit as our schooldays or teenage years, have boundless energy and a feeling of well being. Sadly it seems many kids today are not as fit or as health as kids were years ago. I got to wondering how their health will fare as they become busy adults. 6 months ago a friend and mentor Wag Bennett died, (see earlier post). It somehow motivated me to get in the best shape of my life. This meant setting aside the 'I don't have the time' excuses once and for all. I remembered the words of a great personal development trainer, he said, "for things to change, you have to change; for things to get better, you have to get better". So I decided to change my habits, in terms of training and diet. I set about a regular routine of weight training which rekindled a long running theme of bodybuilding and strength training which started when I first visited Wag's Gym in London when I was 15 years old. I have since decided to compete in a bodybuilding contest, (when I'm ready), and produce a fitness DVD, as a way of setting a clear target to keep me on track. This post is, in part, a way of making the goal public, and hopefully it may motivate others to commit to becoming fitter, stronger and healthier. I should emphasise that I am personally, totally against performance enhancing, (or any other), drugs and am training entirely naturally. Interestingly I'm still building muscle and am in my 40's with good food, training and rest. These pics are after 6 months or regular training and good diet. Bodyfat about 17%. Things are progressing very well at this end. UK's Channel 5 have agreed to make the documentary which will be distributed internationally. A book deal is being planned to coincide with that. The Space Jump Project still needs some sponsorship to get the record jump done this year. There are huge advertising benefits available for companies, in terms of the worldwide media which will report on this event, inclusion in the documentary and book, and many other corporate benefits including presentations after the event and future advertising opportunities. Philanthropists out there who support this event can rely on a 'return' on their financial support in the form of fund raising activities after the jump for their chosen charities. If you have any ideas, contacts or want to be involved in helping us make this happen in any way, get in touch. Project Space Jump 2008 needs your help. 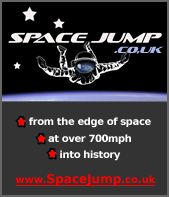 Newsflash: Team Space Jump can reveal that the High Altitude Parachute Jump World Record has been brought forward to THIS JULY 2008. Training is going very well and a gas balloon system has been sourced, along with two full pressure space suits. June 2008, Steve Truglia to perform a 52,000 feet High Altitude Parachute Jump from a gas balloon which Steve will pilot himself, wearing a full pressure spacesuit. July 2008, providing a successful test flight in June, Steve will attempt to break the High Altitude Parachute Jump World Record by jumping from over 125,000 feet. Both jumps will take place in the USA and will be ratified by the FAI (Federation Aeronautique Internationale). Tags: "parachute", "space dive", "space jump", "truglia"
The balloon envelope has arrived ahead of schedule. Some test flights will be made in it soon. The balloon gondola modifications are now being planned to allow me to sit on the edge of my 'step off' platform. Kittenger's step had a sign which read 'The Highest Step in the World'. For this jump mine will read 'The Highest Step in Europe'. Our research shows that this 52,000 feet jump will make me the third highest parachutist in history. Pressure suit, HALO helmet and Oxygen mask, together with the high altitude oxygen consol for both parachutist and balloon pilot are now being ordered in advance of altitude chamber and indoor wind tunnel testing. The parachutist's bail out system (ie the personal oxygen system worn during freefall) is also on order. In the meantime I am planning another training skdiving trip next week to Spain, before visiting the Parachute Industry Association symposium in Barcelona for meetings with potential sponsors. A couple of weeks ago I performed a massive car stunt for Channel Five's Fifth Gear car show, where I've been the resident stunt driver since 2004. It's another in our series, 'How Hollywood Works', where the viewer gets to see behind the scenes, and exactly how we perform some of the movie worlds biggest car stunts. You'll see how we switch stunt performer with artist for the final scene. The repeat of Monday night's show is on Saturday 2nd Feb 08 on UK Channel 5 at 11.00. It's the biggest car stunt we've done yet on the show so be sure to tune in. 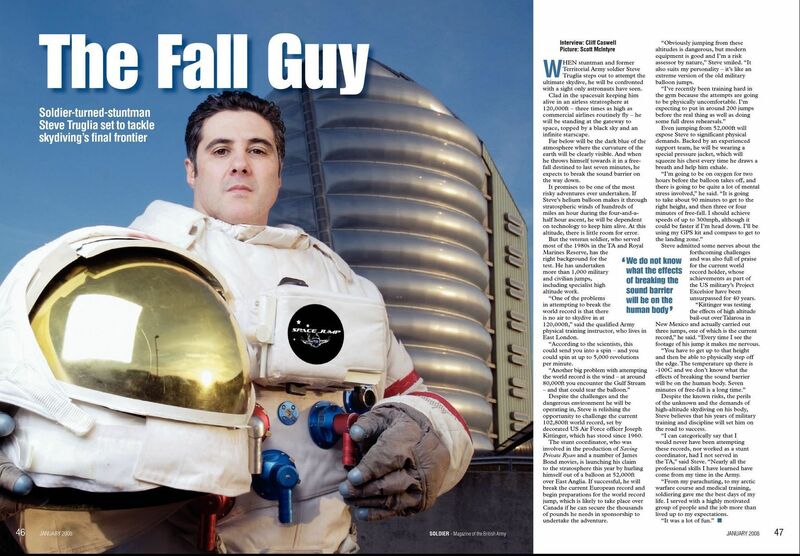 Tags: "Channel Five" "Fifth Gear" "truglia" "car stunt"
Soldier Magazine have run a great two page spread on my forthcoming SpaceJump project high altitude parachute jump record attempts. The article was based on the fact that much of my early parachute training was with the Army, and I probably wouldn't have become a stuntman, and certainly wouldn't have been making these record attempts had I not been a military reservist for so many years. This was where it all started, with early parachute jumps from a balloon at 800 feet. I always loved those jumps because of the thrill of stepping off the balloon edge. It'll be the same on the Space Jump but a whole lot higher! I am extremely grateful to have had the opportunity and good health to have been able to enjoy such adventures with the Army and the Royal Marines Commandos. I'm delighted that my local Esporta Club is to sponsor me in my Space Jump project. I'm currently training at their premier Repton Park Club in Woodford near Chigwell Essex around 4 times a week. The European Record High Altitude Parachute Jump will require me to be at an absolute peak of fitness, strength and flexibility, which I am working towards with the help of this fabulous club. Apart from the great gym equipment, which is brand new, the club has the finest spa and pool of any health club I've ever used, as it's situated in a former chapel, absolutely stunning. 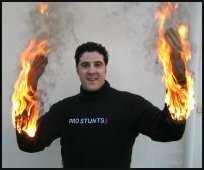 I was asked to perform the opening stunt for the Guinness World Records 50th anniversary television special which went out on Saturday 11th Sept 2004 on ITV1 with 8 million viewers. The producers asked me if I would abseil into the studio from the lighting grid LIVE and be interviewed by presenter Jamie Theakston before the VT of the stunt abseil was shown. Performing the abseil live on prime time TV posed many challenges; the rope had to be dropped as I entered the studio as it was central to the set. If, as often happens, the rope had knotted, I'd be left dangling in mid air. I planned a get out for this scenario which fortunately didn't happen. Those lovely people at the Daily Mirror Newspaper ran a great profile article about my life as a stuntman, and my High Altitude Parachute Space Jump project. The online Stunt Shop and Space Jump Shop is now open with a great range of products. The Stunt Shop offers Prostunts official Stunt Crew clothing. In the Space Jump store there are a number of price ranges for those who want to just buy a T shirt or mug, and for those who want to donate to the project. Corporate sponsors should visit the sponsorship link on the Project Space Jump Site. Tags: "stunt shop" "stunt clothing" "parachute clothing"
I had a telephone conversation with current World Record holder Joe Kittinger (pictured left) the other day. He is 79 years of age now and his record, set in 1960, remains unbroken to this day. Watch Joe's 3 Project Excelsior jumps culminating in his 1960 World Record Jump. It was amazing to speak with Joe, having read so much about him over many years. He was terrific and wished me well in trying to break his record. He followed up our conversation with an email in which he signed off 'Happy Landings!' What a great guy. In respect and recognition of Joe's achievement the Project Space Jump logo feature three stars, one for each of Joe's Excelsior Jumps.